With the top three teams within three points of each other, NA division matchday 12 at the R6 Pro League kicked off with high stakes and impressive shows of force. Some proved they would not be shaken, while others proved they didn’t have what it takes to maintain their status in the standings. Spacestation Gaming could still be in the running for the finals, but that would be a tall order. Excelerate Gaming, Rise Nation, and Rogue are all eliminated from finals, but their job is far from over because \he battle at the bottom continues as teams fight to stay out of relegation. Bottom-ranked Rise Nation and sixth-ranked Excelerate Gaming matched up first on Villa. The pre-stream survey showed an almost even split. Fans gave Rise 49 percent of the vote and 37 percent to EXG, showing Rise some much needed love after a turbulent season thus far. Only two points separated the two teams, so the stakes were especially high for these bottom-ranked teams. Maverick, Buck, Kaid, and Maestro were the bans of choice for the match. While EXG did a decent job of wasting Rise’s time during their first defensive run, they failed to win their gunfights, giving the first round to Rise. Brandon “Shlongii” Escamilla held strong angles as Doc to get a 2K in round two, which contributed to EXG’s round victory. Rise’s failure to use their attacking utility didn’t do the team any favors. Tomasz “Acid” Adamczyk gave a valiant effort in a one-vs-three situation. Although he secured two kills, Acid was unable to lock up the round and EXG found another victory in round three. Parker “Interro” Mackay noted that Rise attacked swiftly, but were undone by the lack of utility in their team comp. EXG, on the other hand, was stacked with utility. Khalil “B1ologic” Pleas showed us that utility should be the priority, especially when he used his Yokai to shut down a last-second Rise plant. If B1ologic hadn’t brought Echo along, the round might have played in Rise’s favor. B1ologic outdid himself yet again in round six when he decimated two Rise attackers, one of which carried the defuser, and furthered EXG’s lead to 5-1. Terrell “England” Lee managed to clutch up as an over-healed Doc in round seven. England’s one-vs-one clutch kept Rise in the match for one more round. In a season of comeback streaks, fans can never count the underdog out. CHAOS has shown us that the underdogs are not to be underestimated in the EU division, and Rise mirrors this pattern in the NA division. In a crazy turn of events, Rise fought back from a 1-5 deficit to win it 7-5. Defense was the name of the game for both teams. EXG failed to gain traction on attack, however. Even one attack round would have saved EXG from the bottom spot. Rise leaves the bottom spot for the first time this season, and EXG now sits in the relegation spot. Since Orgless disbanded, there is no auto-relegation spot, but EXG may have to fight for their spot in Pro League if they don’t have a solid matchday 13. England had some off-handed criticisms for former coach Owen “Pojoman” Mitura during the post-match interview. To Interro’s surprise, England alluded to Pojoman being a “flop.” It was an interesting way to bring the match to an end. While Rogue cannot qualify for finals, Spacestation Gaming may still be able to make it through to finals. Much like Rise and EXG, Rogue and SSG are only two points apart from each other. The pre-match survey gave 59 percent to SSG and 37 percent to Rogue. Hibana, Jackal, Pulse, and Maestro were banned out of the match. SSG shook off the rust with a round two win to follow up a round one loss. Rogue’s defense fell apart in round three when SSG found their footing on attack. Nathanial “Rampy” Duvall found an early enemy in the form of surprise nitro cells, which is always a frustrating way to go in Siege. Rogue stopped SSG from furthering their momentum in round four. Interro noted that Rampy’s early deaths hurt SSG in a big way and contributed to their lack of force in the early rounds. With the match at 2-2, Robert Flynn pointed out that SSG’s lack of team comp changes helped corner the team into a sluggish rut entering the half. Flynn’s assertion proved correct when Rogue quickly dispatched SSG in round five. However, SSG showed a stronger presence in the match on defense than they did on attack to bring the match 3-4. Spencer “Slashug” Oliver tried his best to level the playing field in round eight, but Rogue fell apart and threw their man advantage away. SSG clutched round eight in a two-vs-three scenario with a last second defuse. With the match tied 5-5, SSG needed to grab the final two round wins to stand a fair chance of making finals, according to Flynn. Round twelve was the do-or-die round for SSG, and they failed to hold their ground when Rogue pushed onto Kitchen in the final seconds. Javier “Thinkingnade” DeAndre Escamilla and Dylan Bosco’s solid fragging efforts proved futile when Rogue managed to tie up the match at 6-6. It was disappointing to see SSG lose out on such a huge match. SSG’s chances of making it to finals are almost non-existent at this point in the season. Flynn and Interro seemed to be rooting for SSG, and both of them kept bringing up the miniscule chance of SSG making it through to finals. It’s always nice to see people sticking by the underdogs and the spirit of the community seemed to be echoed by both casters. DarkZero Esports looked to solidify their place in the finals while facing of against Evil Geniuses on Oregon. Interro noted that EG had only acquired two points in three weeks, which is not where you’d want to be when facing off against the top team in the division. Evil Geniuses snagged 54 percent of the pre-stream vote, while DZ only managed to garner 36 percent. Blitz, Dokkaebi, Vigil, and Maestro served as the banned operators. DZ came in hot by taking two EG defenders off the board, one of which was dispatched within the first 30 seconds. Before we knew it EG had somehow gotten themselves in a one-vs-four. It wasn’t a great first round for EG. Zachary “Nyx” Thomas found the early Jager kill to gain control of tower and that started the DZ landslide that was round one. Nyx repeated his early frag in round one by taking down Troy “Canadian” Nevin Jaroslawski within 30 seconds twice in a row. Nyx got himself an impressive ace while attacking Laundry in round two. Don’t let the ace fool you, there was a lot of cohesive teamwork that went into Nyx’s ace, and Nyx played his Ash the way he needed to in order to get control of site for the defuser carrier. EG managed to slow DZ in rounds three and four, however, by denying DZ the plant several times and pushing the match to time. DZ snagged round five with Flynn noting that nobody on EG was supporting Canadian’s Pulse roam. EG’s final round on defense saw Canadian shake things up with Clash and a round win to tie it up 3-3. We saw DZ supporting each other in major ways on defense. It seemed that DZ were always lining up for trades if one of their teammates was going to go down. Matthew “HotanCold” Stevens came in clutch several times during round seven with his Doc flanks. EG continued to give DZ a good run by tying it up at 4-4. Austin “Yung” Theodore Trexler and Ammar “Necorx” Mohammad Albanna completely shredded the entire roster of DZ with a surprise last minute hatch drop. Interro and Flynn both highlighted their disappointment in DZ for dropping a Laundry defense. It was odd to see DZ drop the round in such a spectacular fashion. With the match 5-4 in EG’s favor, DZ really needed to tie it up if they wanted to lock in that finals spot. It wasn’t meant to be for DZ, and they dropped the pivotal round 10. The top-ranked team’s only hope was to tie the match 6-6. Nyx switched spots with Canadian by being taken out early on almost every defense round. The tables turned in a big way when DZ allowed EG to casually lock up the match at 7-4. EG is now tied with DZ at the top of the NA division. Interro pointed out that the narrow chance of Spacestation Gaming making Milan is now ousted. DZ really dropped the ball here. This was the last match DZ needed to lock in their Milan finals spot and they just couldn’t get the job done. Conversely, EG proved that the rough past weeks did not showcase who they are as a team. Now both teams will have to worry about Team Reciprocity. Things can only get more intense from here on out as we approach the end of the regular season. 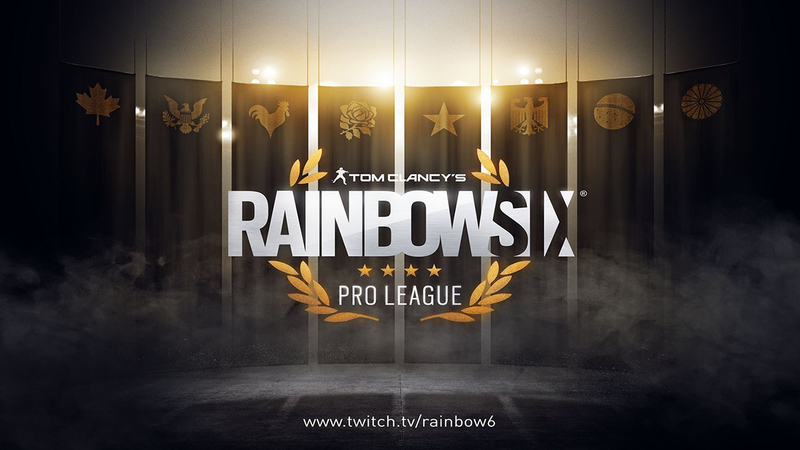 R6 Pro League matchday 12 continues with the LATAM division Wednesday, April 10. As always, fans can catch the official broadcast here.